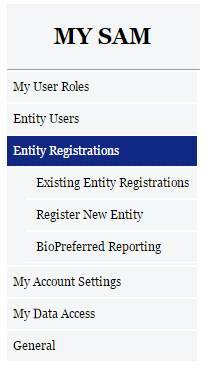 From the “My SAM” page, select “Entity Registrations” in the navigation panel. You are taken to the Registration Overview page. This page details each section that you may come across during the registration process. Please note that what sections you actually see during the registration process depend on your purpose of registration. Select “Start Registration” when you are ready to begin the registration process. Before being taken to the first section of the registration, a fly out page will appear titled “Before You Start.” This page details the information you need in order to register an entity. Take the time to read this page and gather the information you need ahead of time. DUNS Number, D&B Legal Business Name, and Address – You will not be able to save a draft entity registration if you are unable to verify your entity’s DUNS information. If you do not already have a DUNS number, you can call D&B at 1-866-705-5711 or request a DUNS number for free via their website. Department of Defense Activity Address Code (DoDAAC) – This is applicable for the Department of Defense (DoD) entities only. Taxpayer Identification Number (TIN) – TIN and Taxpayer Name are optional for foreign registrants who do not pay taxes to the U.S. Taxpayer Name – Your Taxpayer Name might not be the same name as your “D&B Legal Business Name” name. For example, your D&B Legal Business Name is “SAM, LLC,” but your Taxpayer Name is “System for Award Management, LLC.” To find your Taxpayer Name, review your tax statements from the IRS (such as a 1099 or W-2/W-4 form). Your Contractor and Government Entity (CAGE) Code, if you already have one (if you don’t, one will be assigned during registration). 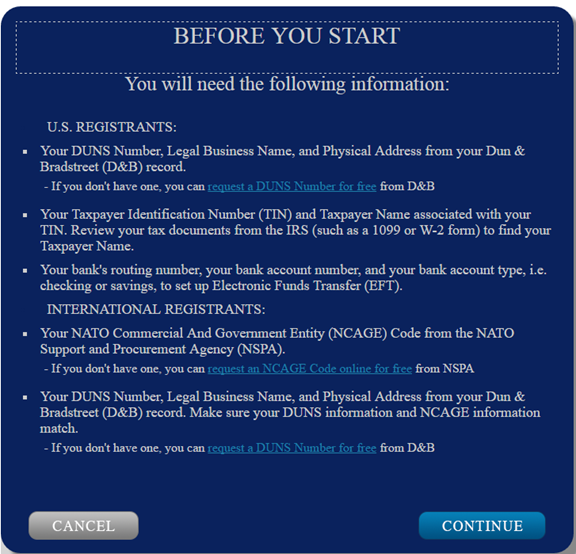 Foreign entities are required to enter their NATO Commercial and Government Entity (NCAGE) Code. 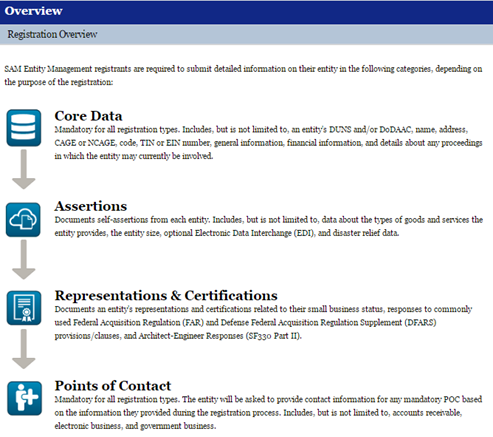 Learn more about what an NCage Code is and how to obtain one.